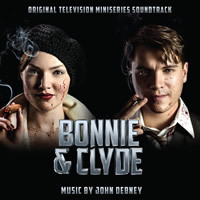 La-La Land Records and Sony Pictures Television presents the original motion picture score to the world premiere television miniseries event BONNIE & CLYDE, starring Emile Hirsch, Holliday Grainger, Holly Hunter and William Hurt, and directed by Bruce Beresford. Acclaimed composer John Debney (PASSION OF THE CHRIST, IRON MAN 2, HATFIELDS & McCOYS, JOBS) brings this infamous true-life crime saga to roaring life with a robust, knock-out score. Produced by John Debney and Dan Goldwasser, and mastered by Noah Synder, this exciting release features attractive art design by Dan Goldwasser, which includes brief liner comments from the composer and director. BONNIE & CLYDE premieres December 8th and 9th, 2013 on the HISTORY, LIFETIME and A&E networks.